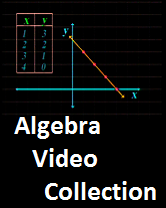 A collection of short videos that cover topics and teaching tools related to Algebra. Examples of Algebraic Expressions: 'two times y' and 'two y plus 5'. Does Order of Operations Matter? Practical Problem: How Fast Can Two Workers Mow a Lawn? Practical Problem: Can the Truck Fit Under the Underpass? Practical Problem: How Much Weight Can One Beam Hold?